Urethane Seals – Tight Tolerance Urethane Seals! 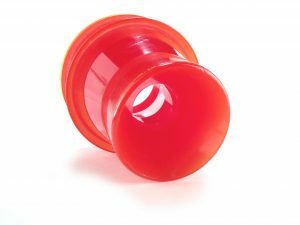 Urethane Seals ? You’ve come to the right source! Urethane Testing Seals: Urethane testing seals are molded to tight tolerances and can be manufactured to withstand harsh conditions while lasting for years in even the most demanding industrial applications. Urethane testing seals are economical in any volume and provide excellent abrasion and chemical resistance. Common cast urethane testing seals applications are for bulk material transfer systems, mobile hydraulics, machining services and gas fittings. Urethane testing seals offer unique solutions which can be manufactured for a wide range of industrial applications. Industrial Seals: Industrial seals are one of Plan Tech’s specialty industrial products that we manufacture. Urethane has a great ability to be resistant to most chemicals and has great sealing properties both in high and low-pressure conditions. Urethane Seal Rings: Urethane seal rings are available in any profile for many industrial applications. Polyurethane seal rings are made from a high-quality TDI material and can be supplied in any color or durometer. Custom cast urethane seal rings are a great solution when traditional seal rings fail or are not available in the size for your custom application. Urethane seal rings are available in all sizes and a variety of additives can be added to enhance wear properties or abrasion resistance. Urethane Hydraulic Seals: Urethane hydraulic seals are ideal for low-pressure sealing or as dust seals. 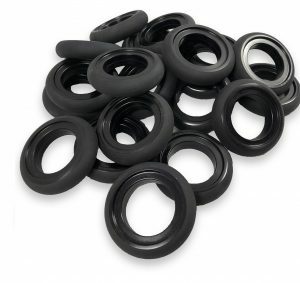 While high-performance Nitrile rubber dual opposing spring seal lips are required for high pressure sealing urethane hydraulic dust seals and low-pressure seals are ideal for a cost-effective one-off replacement or for high volume sales. Urethane Pipe Seals: Urethane pipe seals are found in many industries which include high-pressure gas fittings while others are used in drainage applications. Urethane is a great choice when choosing a seal because of its ability to act like a gasket and the ease of being machined or cast to whatever size the application is needed for. Urethane is the toughest and most abrasion-resistant of all elastomeric materials. 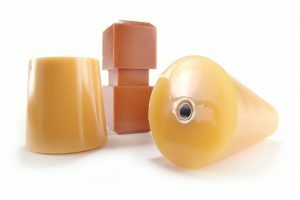 Cast Urethane Seals: Cast seals are molded to tight tolerances and can be manufactured to withstand harsh conditions while lasting for years in even the most demanding industrial applications. Cast seals are economical in any volume and provide excellent abrasion and chemical resistance. Common cast seals applications are for bulk material transfer systems, mobile hydraulics, machining services and gas fittings. Urethane Spray Nozzles: Urethane spray nozzles are found in hundreds of industries and applications. Custom urethane spray nozzles perform tasks from cleaning, lubricating, dispensing, sanitizing and high demanding applications like media blasting. Urethane is an ideal material due to its low cost while replacement parts can be customized for special applications. Urethane spray nozzle tips have the ability to tackle high demanding applications like sandblasting and will outperform most plastics, nylons and OEM replacements. Polyurethane Seals: Polyurethane seals are made from our best urethane material due to the extreme conditions in a wide variety of applications that we expect our seals to encounter. Plan Tech’s cast polyurethane seals will remain flexible in extreme weather conditions and are rated up to 180F working temperature in a variety of different applications. Polyurethane Shaft Seals: Polyurethane shaft seals are a popular choice due to urethanes great ability to be molded into any profile while delivering great chemical resistance and sealing capability. Polyurethane shaft seals can be molded as big as 5 inches with tight tolerances for maximum sealing properties. Urethane Slider Valve Seals: Urethane slider valve seals that are designed and manufactured by Plan Tech boost service life. With our team of experienced in-house urethane molding engineers who are specialized in seals, molding and waterjet cutting equipment, we produce custom urethane slider valve seals that offer the very best of tight tolerance. Hydraulic Polyurethane Seals: With our world-class facility and the exceptional technical prowess of our team of engineers, we are capable of casting hydraulic polyurethane seals in different hardness. So, no matter the profile of hydraulic polyurethane seals you require for your application, you can rest assured of finding your specification from our line of standard hydraulic polyurethane seals. Urethane Filter Seals: Urethane filter seals are one of the several urethane products or parts that find applications in different industries due to their remarkable physical properties. The urethane filter seals manufactured by us at Plan Tech possess remarkable ability to resist wear, abrasion, corrosion, and chemicals. Tight Tolerance Seals: Therefore, come to us with your drawing, sketch or idea of tight tolerance seals and we will produce a product that will more than meet your expectations. One important factor about cast urethane parts is that the composition of the parts can easily be manipulated. You can choose whether you want an end product that is rigid, flexible or something that is even similar to rubber with a gummy texture. Urethane Piston Seals: When selecting the proper urethane piston seals for an application, a good number of design elements and general guidelines must be put into consideration. Utilizing these criteria throughout the selection process will ensure that the desired sealing requirements of the application is met. Urethane U-Cup Seals: Being the number one choice of many construction and off-road vehicles that rely greatly on hydraulic and/or pneumatic power our urethane u-cup seals are designed to work effectively in almost every application. They are molded to tight tolerances and built to withstand extreme conditions while maintaining the flexibility needed to seal even in the most demanding industrial applications. Molded Urethane Seals: Plan Tech provides precision molded seals, manufactured with high-end equipment, using only urethane materials that have passed our certification processes. Our molded seals reduce equipment downtime and save on material costs. Polyurethane Valve Seals: The Plan Tech engineering team also creates custom polyurethane valve seals at low tooling costs. This means that we can design your polyurethane valve seals to exacting standards and with high flexibility. Our client’s project always begins with rapidly built prototypes manufactured at low cost for testing and evaluation. High-Pressure Urethane Seals: High-pressure seals are extremely tear resistant and have a high tensile property. They are water and fungal resistant, have strong bonding properties, hyperelastic and chemical resistant, these properties make it durable and more preferred over rubber and plastic. Plan Tech has 4” x 8” flow water jet capability of cutting thousands of High-pressure seals frequently out of just one sheet resulting in a low–cost industrial seal for any application. Cast Polyurethane Seals: At Plan Tech, we manufacture cast seals from high-performance prepolymers with high standards which in turn reduce downtime and replacement costs. Our specially custom made cast polyurethane seals are commonly used in medium duty applications that involve a pneumatic cylinder, rod or piston. Plan Tech’s seals are outstandingly able to withstand more loads than rubber because they are harder than rubber and yet more flexible than plastics. Their flexibility is accountable for their strength and remarkable ability to resist impact. Seals are the perfect choice for applications against severe wear regardless of low temperature. For some decades now, they have been the most used materials for environments that are highly abrasive owing to their super ability to resist abrasion. No other form of elastomers, metals, and plastics has a better abrasion resistance than polyurethanes. Plan Tech’s seals abrasion resistance ability is rated to be 10 times better than what other materials can provide. Like their abrasion resistance ability, the properties of polyurethane seals are highly capable of resisting oil and chemicals. This enables them to maintain stability (with minimal swelling) in water or oil etc. If you are looking for elastomer materials to use in subsea, then polyurethanes should be your ideal choice for urethane seals. Resilience is generally a product of hardness. Polyurethanes are the perfect choice for elastomer applications that can absorb shock. They have a high vibration frequency or outstanding ability for quick recovery. Their remarkable resilience ensures Plan Tech’s seals are very tough materials! Plan Tech fabricates custom tight tolerance seals with a variety of thickness, colors, and hardness. Thickness ranges from .020’’ to ½” are most commonly water jet cut with a thickness tolerance of +/-.010 and are typically supplied in a durometer range between 60A and 90A. We routinely test according to ASTM standards to meet the tight tolerance custom molded seals specifications. Custom thickness, colors or FDA requirements are also available or any other durometer from 20A to 75D. Another common molding process at Plan Tech is compression molding custom seals. This allows us to have a radius or details on both faces of the part. Between molding, water jet cutting or compression molding we can handle any volume or size of your requirements for custom rubber seals! Polyurethane is a great choice of material for seals due to being chemical and abrasion resistant with a temperature range from -20F to 180F. Custom polyurethane seals consistently outperform plastic, rubber, and steel in its capacity to resist harsh environmental factors such as abrasion, heat, oil, acid, solvents and many chemicals. We also incorporate a full line of polyurethane additives for enhanced performance of our tight tolerance seals! Please Contact us for further details regarding Custom Urethane Seals!